Amazon.com Price: $5.50 (as of 2019-04-18 10:16:02 GMT) Product prices and availability are accurate as of the date/time indicated and are subject to change. Any price and availability information displayed on Amazon.com at the time of purchase will apply to the purchase of this product. Molds and Things at Amazon.com for your all bakery needs like Cake making tools, Chocolate Molds, Cookie cutter, Fondant Mat, Silicone mat. 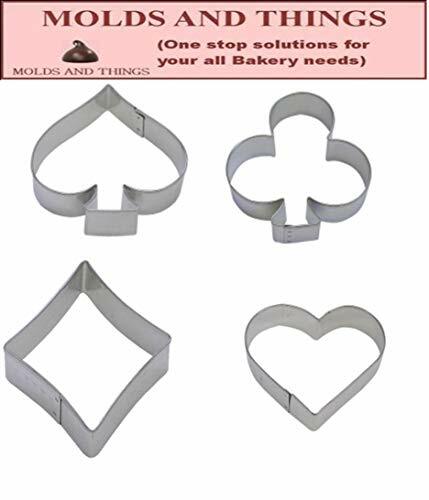 Tinplated steel Card cookie cutter set. Includes Club 3.25″, Diamond 3.25″, Heart 3.25″, and Spade 3.75″. Hand wash and dry thoroughly. Discounted shipping rate applies 2nd items and more.